- All DrapeStyle Pricing is Per-Panel. - Two (2) Panels will make a complete pair. Add 2" to this length for poles from 1' to 2" inches in diameter to accommodate for rod take-up*. *Rod Take-Up refers to the amount of fabric that is required to shirr the fabric on the rod. DrapeStyle's standard rod-pocket is designed to fit up to a 1-1/2" pole. For larger poles please contact a DrapeStyle Designer. Your selected length will include the 3" pocket and, if selected, a 2" Top-Flange. Measure from the top of the pole to the floor. Add 1-1/2" to this measurement for Grommet Placement. Measure from the bottom of the drapery ring to the floor. Measure the width of your window from outside molding to outside molding (A). 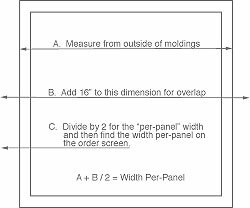 Divide this total dimension (A+B) by 2 to establish the "Per-Panel" width (C). Use the guide below to determine the coverage area for each pleat and fabric style. The Approximate Finished Width Will Display in Inches Next to The "Width" Drop-Down When Ordering. Grommeted Panels will cover the same in Solid Fabrics and Striped Fabrics. 4. How Many Rings Will You Need? - Drapery Hooks are pre-installed on each panel (except Rod-Pocket + Grommeted). "Standard Lining" is a tightly woven cotton/poly blend resulting in a fine satin finish. "Flannel Interlining" is a heavy-weight cotton flannel fabric. "Blackout Lining" is a opaque heavy-weight cotton/poly blend which is off-white in color and is impervious to light. "Bump" is also referred to as "English Bump" and is a heavy, thick cotton flannel interlining. Puddling Guide - If you prefer for your drapes to Puddle, here are some general guidelines. DrapeStyle manufacturers all Drapery in our Arizona Studio using only the highest quality materials and processes. All of our natural materials including silk and linen may include some minor natural imperfections and dye-lot variations. For additional information and assistance please call a DrapeStyle Designer at 800-760-8257.